Please send me more information on LocoMotion ! Try the exciting new LocoMotion Fiesta Bike and come discover why Todos Santos is known as the Pueblo Magico, or “magical town” of Baja! Pedal to the rhythm of your favorite music with 14 of your new and old friends. Together we’ll explore this special place where organic agriculture, farm-to-table gastronomy, art galleries, and history are all located in this charming spot nestled between the desert and the ocean. Your bilingual tour guide will show you the town’s charming Mexican architecture, teach you about its history as a sugar cane capital. 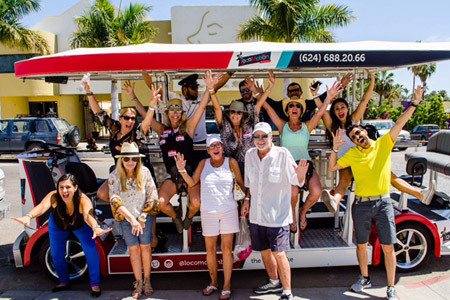 During our three-hour bike tour, there will be endless discovery and fun: in addition to seeing the town’s historic church, theater, and museum, riders will have a totally interactive experience with a variety of activities like a mixology class, a local tequila tasting, and a traditional Mexican food preparation class and a wine tasting. After an exciting day of warm weather, great company, good food, and fun, we’ll end the trip with locally made ice cream and free time before we head back to Cabo. Discover a part of Mexican history you never knew existed, we promise it will be an experience that you’ll never forget!